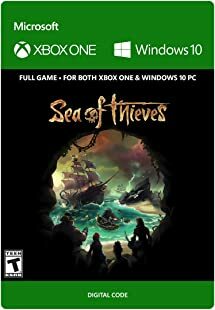 Recommended New Video Game Release: Sea of Thieves on Xbox One! Grab Sea of Thieves: Standard Edition – Xbox One for $59.99 at Amazon! Sea of Thieves: Standard Edition – Xbox One has a scheduled release date of March 20, 2018. Sea of Thieves offers the essential pirate experience, from sailing and fighting to exploring and looting – everything you need to live the pirate life and create all-new legends. With no set roles, you have complete freedom to approach the world, and other players, however you choose. Whether you’re adventuring as a group or sailing solo, you’re bound to encounter other crews in this shared-world adventure game – but will they be friends or foes, and how will you respond? Pre-order Sea of Thieves and you’ll receive the exclusive Black Dog Pack (containing stylish clothing and items with unique, spectacular designs) as well as a chance to join other pioneering pirates in a Closed Beta ahead of the game’s worldwide launch on March 20, 2018! For news on Closed Beta dates please keep an eye on our site. A shared-world adventure game by acclaimed UK developer Rare Ltd. Xbox Live Gold required to play (sold separately). Live the essential pirate life in a world rich with Rare’s irreverent charm. Sail and fight together, hunt treasure and create your own legends! A fantastical world of unspoiled islands, mythical monsters and mouth-watering loot. Total freedom to decide how you approach the world and its players. Available on the Xbox One family of devices and Windows 10 PCs. Supports Xbox Play Anywhere and cross-platform play. Previous PostPrevious New Game Release: Burnout Paradise Remastered PS4 Xbox One Discounted to $31.99! Next PostNext Recommended New Release: Far Cry 5 on PS4, Xbox One, PC!